Visiting Italian small towns: Ivrea and Chiesa di San Nicola | Where's Zoe now? I’ve lived in Turin for 3 years now, and the more I get to know Italy the more I feel like I’ve hardly seen it at all. I’ve “done” the tourist trifecta of Rome, Florence and Venice, and I’ve made the odd weekend trip to slightly less common destinations like Bologna, Genova and Naples, but almost all my travel has focused on the big cities. I’ve barely been to the mountains, I’ve never found a beach that wasn’t crowded (well, I did once… in February), my knowledge of the smaller towns around here is limited to being able to say, “yup, this looks like a northern town, alright” as I stand in a stereotypical piazza with a church and some cafes. And the thing is, when I do finally get out of the city, I love it. Like yesterday, when I spontaneously decided to go to Ivrea for the afternoon. 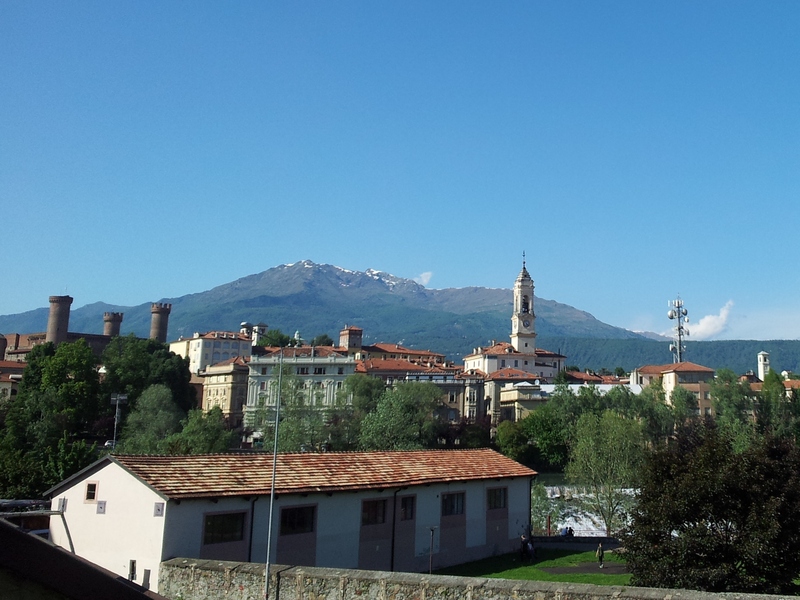 Ivrea is a town on the edge of Aosta valley, situated with the Alps looming behind. It’s best known in the area for its annual Battaglia delle arance (“Battle of the Oranges”) during Carnival, which is literally what the name suggests: people violently throw oranges at each other for entertainment (video proof from the BBC). Looking across the river to the historical centre. The Orange Battle was really the only thing I knew about Ivrea before I went, apart from having passed through on a train to Aosta once and seeing a quiet pleasant-looking town on a river. As I discovered yesterday, the historical centre is on the side of a hill, and it’s worth heading up to the top, where there’s a castle (open Sunday afternoons only), a cathedral, and a small church, Chiesa di San Nicola da Tolentino. Rooftops on the way up the hill. It turns out, I had great timing. Chiesa di San Nicola is almost always closed to the public. However, in May and June this year it’s open Friday-Sunday, and the woman who greeted me was there as part of a program to offer free guided tours of the artistic and architectural highlights. If you’re in the area, I’d recommend a visit (tours are probably Italian-only). From the entrace, the church looked like a single room, with a large altar at the front and some statues on the wall behind it. To my surprise, after we looked at the highlights of the side walls and the ceiling, we ducked around the back of the altar, to find a second “room” with carved wooden choir stalls, hidden behind the front altar. (Whoo! Bonus art!) Each seat has a different image, showing scenes from the life of Nicola. The church also has a fresco-ed ceiling (well duh, it’s baroque) but this ceiling features a circular hole, maybe 30 cm across and patched up against the weather. During the war between the French and the Piedmontese in the early 1700s, the church had a bomb thrown through the roof. Fortunately, it didn’t explode, and is kept in the church to this day. Of course I didn’t think to take any photos, but you can see some photos of the church in general here. 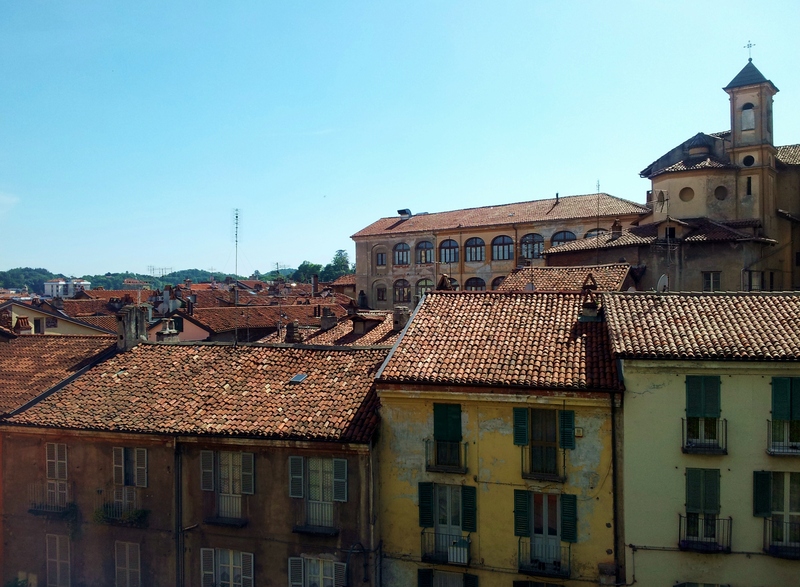 This entry was posted in Italy, Living in Turin and tagged art, baroque, church, day trip, ivrea, saturday, travel on May 10, 2015 by Where's Zoe Now?.